Pythagorean Theorem — Applications On Real Time…! Suppose that you already have seen this formula and you want to use it in real timing: a2 +b2 =c2 You live on a 5th floor on a building near Downtown LA. Suddenly your freaking neighbor on the 4th floor starts a fire. All because he caught his girl chatting with another guy. Not that she was talking to a colleague on HP. Not that we know. He bashes the whole apartment to his uppermost delight. He leaves her unconscious and you happen to see him leaving, and run to her door. and take her out on the hallway and flames catches up with you both. The only way to stay alive is keep going up. You call 911 and they get hold of your emergency. A fire engine gets there in 6 minutes. You are by the window and hope the telescopic aerial ladder will be able to reach you both. 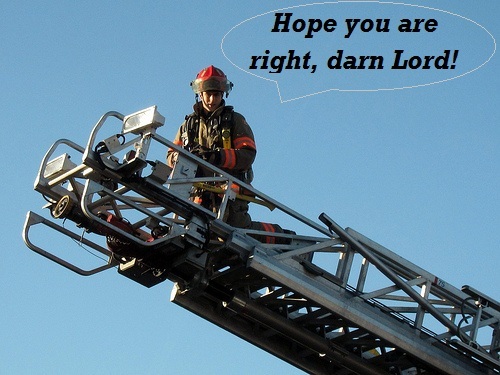 A fireman does a quick calculation: We have 5 floors, each floor is 8.5 feet high (Hurry up Lord!!) Total height of the target is 8.5×5= 42.5 feet The closest an Engine can get (sideways) is roughly 7 feet (Lord please!!) We don’t worry about nothing else and apply the theorem: (42.5)2 + (7)2 = (ladder span needed)2 = L2 The fire-guys will solve this equation in 5 seconds… 1806.25 + 49 = L2…. More: Pythagorean Theorem — Applications On Real Time…!